Yes, Mark was amazing he not only amused kids but adults too were very impressed and amazed. He is very friendly to kids, pleasant, and easy-going person. I would like to call him again in any other party. Mark is also very patient with kids which i noticed when he was making balloon animals for them. Magic Mark was 15 minutes early for the event, which gave him and I time to go over the game plan for the Easter Egg Hunt. He engaged the children with his magic tricks and his ablity to twist balloons. he gave each child an opportunity to request what shape they wanted the balloon in and even color of the balloon. if their balloon came on done or broke he joyously twisted them another. i will be hiring Magic Mark for future events at our church. the parents were very pleased with Magic Mark also for his professionalism, talent, becuase of his talent the children and parents had too much fun! My husband son and I were extremely satisfied with Mark. He arrived as planned and even delayed showtime about 1/2 hour cause people actually don't show up for parties on time. Lol. He kept the kids entertained and was very gracious. My son loved the show, as did the other children. Marks show was interactive and kept the kids involved. I hope he was able to pick up future business. I know I will refer him if someone ask, or I suggest. Thanks Mark for making Bryces birthday event a success. Mr. Mark Luedtke was awesome with the kids at my son's 1'st birthday. Everybody was enjoying his magic show. He has a great personality. I will recommend him to any of my friends or family. Will love to have him again on another party. The kids and I also had a blast with your magic show last summer,I will keep your information in my list of "tried and true" performers to consider for future Summer Reading Programs. On time, professional even the parents had a wonderful show. To this day I'm still getting text messages and kind words regarding the magician he's definitely someone that will make your party rock. Mark was beyond great. He showed up 30 minutes before the actual show time went over some stuff with me. Patiently waited for us to finish eating and cut the cake and then he started his magic show. And boy was it magic. The kids were glued to the floor and didn't wanna miss a thing. All my guests were beyond happy and everything was great. I was very pleased with the show that mark put on for our party. I will always count on mark when I have a party and in need of entertainment. Great job!! Mark was very professional, came early and stayed as long as needed to satisfy all of the party people. Great job Mark I would refer you in a second!! !Thanks again. Totally trustworthy and a gentleman. Mark the Magician! He kept around 18 kids engaged for a hour which was outstanding! He was very good at his job, adults and kids really enjoyed the show and all the guests were very appreciative. Thanks Mark . 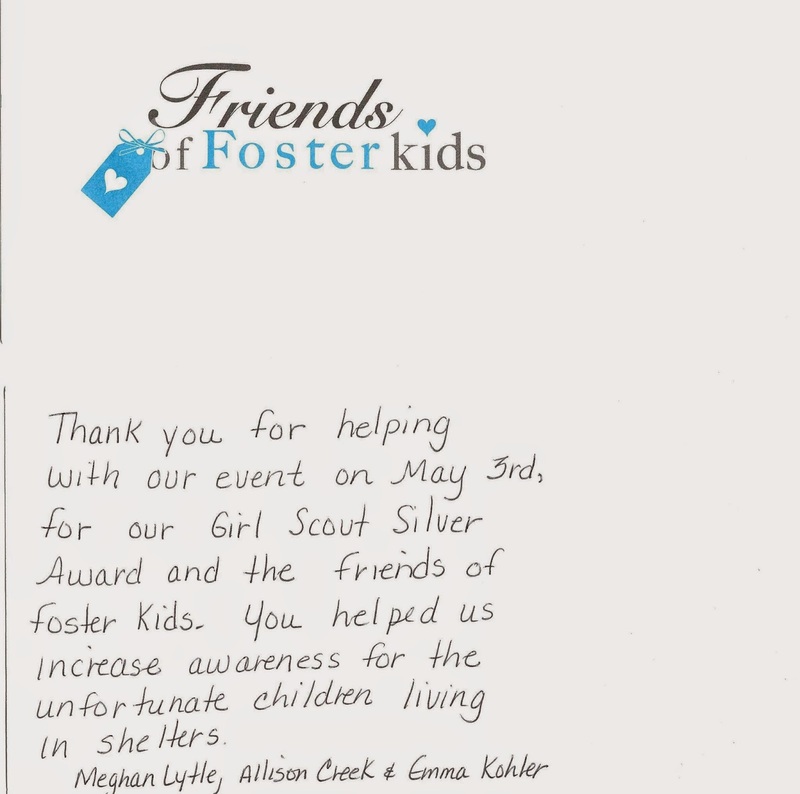 Thank you so much for participating in the girls Silver Award Project for the community. Shelby Twp and Kiwanis states they are going to make this an annual event now. Thank you again, you did a wonderful job. Even the adults enjoyed your show! Thank you Mark ! The kids had a blast. kids loved him and he was very patient. The kids loved the show. I had never seen the adults in my family so focused! They loved it also! I would for sure hire you again and suggest you to people. Thank you so much again! Hopefully see you for her first birthday! "Mark did a great job of entertaining the guests at our wedding. His upbeat attitude and creative magic tricks helped to add a lot of fun to the evening." " I found Mark while searching for balloon artists for my daughters birthday. When I spoke to him he said he also did magic shows. Oh am I glad I called him. His magic show kept not only the kids but the adults engrossed as well. He played an awesome part in making my party a hit. He is also very professional as he came in early and had his setup ready while patiently waited for us to finish snacks and a little chit chat before his show. I would gladly recommend him to anybody and hope to have him over for another party soon." Excellent - very entertaining. Arrived on time and used every minute of time to be with his audience. Magician Mark was fantastic! Kids were lining up to see him, and everyone had a blast! Highly recommended. Thank you very much for a wonderful show! Thank you for doing our party, Jamison loved it! Mark did a fantastic job performing at my son's 10th birthday party. He captivated the young and old (40-75 yrs of age) with his magic and enthusiasm. I have to admit I was little apprehensive on hiring him not knowing if he would be able to hold the attention of 10 yr old boys BUT he did the entire time! He geared his show to the age of the children. For example, he taught the boys a couple of tricks instead of making balloon animals, which he normally does. After his performance, he hung out with us for a while & helped my son with some of the magic tricks that he received as gifts. Overall, the night was a success due to his professionalism and entertainment! Mark was amazing. Showed up on time, gave a great performance and ensured that everyone got a balloon animal (some wanted multiples)! I would absolutely recommend him for any party! The kids absolutely loved him! Great job Mark and thank you again for makings my sons 8th birthday a memorable one! Kids really enjoyed your magic show at Harper's birthday party. Thanks for keeping them entertained! Mark was simply wonderful. No matter age group he was great with them. On time, quality very good, he really knows his craft and how to mix with people! "Thank you Mark! The balloons and magic were fantastic!" Everyone enjoyed the magic show! Mark was great with the kids and showed up on time as well. Will definitely recommend and hire again! "Thank you Mark for making my little girl Hazel soo happy at your show at Better Health!! She still talks abou it! You're very talented!" "Mark did an excellent job at our party. Our girls are still talking about how they never expected to have the best birthday party ever! Thanks Mark :)"
"Mark did a great job of entertaining the room. He engaged the children and adults and everyone seemed to enjoy him. He was on time and even stayed to finish his show." "Mark was an incredible magician and fantastic with the children. Put on a very entertaining show and everyone from the children to adults loved the show! I would most definitely re come d him to anyone looking for a great time at any party! You walk away happy and very impressed with the different illusions/ tricks! Also, balloon animals were amazing:-). Great show Mark"
"To say Mark is amazing would be an understatement!!! Not only did he put on an awesome magic show that was fun for everyone including the adults, he made unlimited ballon animals, flowers and hats for all the kids!! The best part was seeing him adapt to the theme of the party and have a Disney Frozen sing alone session with the kids... Which they really enjoyed"
"Our guests enjoyed the strolling magic that Mark provided for our holiday event." "Had so much fun yesterday! Thank you again for all your time, and patience ... We will definitely be calling you again for another event (just no more surprises ) the kids loved you and still are talking about all the magic. I think we have a few kids who want to be a magician now when they grow up"
"Mark was OUTSTANDING at our Event!! We ran a fundraiser and he was extremely friendly doing one on one magic with customers and supported our fundraiser. All the audience thoroughly enjoyed his on stage act and he was Phenomenal! I really enjoyed working with and won't hesitate to hire him again! Thank you!" "Mark was easy to work with. Easy to schedule and very professional at our event. Mark walked around as one of the guest and entertained small groups at a time. Our clients found him to be very entertaining. I would definitely hire Mark again." "It was a pleasure will always use Mark for all of our social functions for our kids!! Excellent Performance!!! Kids could not stop talking about him." "You definitely were the best pick out of all the other magicians. I definitely am happy I chose you. Thank you for everything again. Great job! :-)"
"Had a great time with Magician and Illusionist, Mark Luedtke, today at Oakmont Manor! The residents loved him and they all took home a balloon animal, which they loved!" "Mark was great with the kids and adults . The show was amazing and kept 10 young boys and girls fully engaged - they did not even leave their seats!! And the ballon animal part if show was a total hit!" "Mark was awesome! Great with the kids and FULL of energy! Pick him for any get together and you wont be disappointed!" "The show was highly entertaining and fun. The kids really enjoyed the magic tricks that Mark performed. I Highly recommend him to make your child's birthday special !" "Mark preformed at my son's 7th b'day party in Garden city, MI. He was on time and work very well with all the kids shouting out in the crowd. My son was trying to do magic tricks all night long! We all enjoyed and were stumped by the grand illusion! :) "
"Mark was great he showed up to a party with about 15-20 children in the middle of summer and held all of their attention for the whole show. These children ranged from 6 months to 13 years. Very impressed, he even stayed to sing happy birthday to the birthday girl and have some cake. The BEST!" "Thank You so much Mark u did an Awesome magic show, kids and adults both had fun... it was the highlight of the party... everybody was asking about your details to book you... thank you so much, hope you get many more customers from us!" I saw you perform at a friends daughters party, you were AWESOME! I would definitely love to have you there for my sons first birthday! "It was a fabulous show & despite our face painter not showing up, the kids didn't even miss the facepainter!" "The kids loved magic Mark Luedtke. He does such a great job. Everything was wonderful we all had a great time, Mark the Magician was awesome!" "All the kids loved you....thanks for an AWESOME show! "Used him for a school event! He was a hit! The kids really enjoyed him! Thank for making our event that much better!" 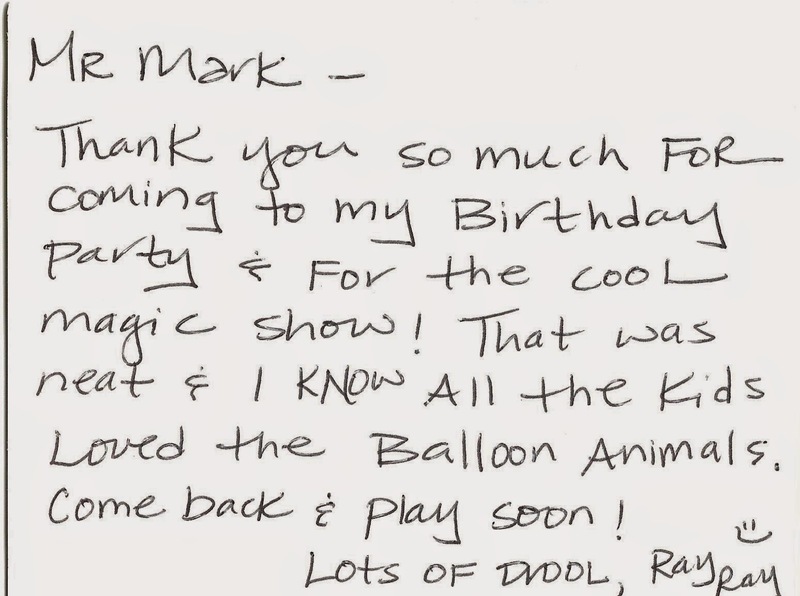 "Mark performed a magic show and ended with balloon twisting at my son's first birthday party. He was very enthusiastic, energetic, and entertaining. The kids and adults all loved the show. I would highly recommend hiring Mark for your next big event!" "Ashton birthday party was a success! Thanks everybody for coming and thanks to Mark Luedtke for putting on a great magic show. Everyone was impressed with your performance!!!!" "The kids had a blast and the magic show was a hit... couldn't have ask for a better party. Ashton still on cloud 9 from yesterday!" "Kids and Adults have enjoyed the show very well. Awesome Entertainment for 3 year old birthday party!" "We had a 10 year old birthday party and mark went above and beyond our expectations. He was scheduled for an hour but went over an hour and the kids enjoyed him and the adults did too!" "Magician Mark was amazing! He entertained the kiddies at our Eastland Center Easter Bunny arrival event and had them laughing and oohing at all his magic... The balloon art was great too. His interaction with the audience was fantastic! We definitely will have him back!" 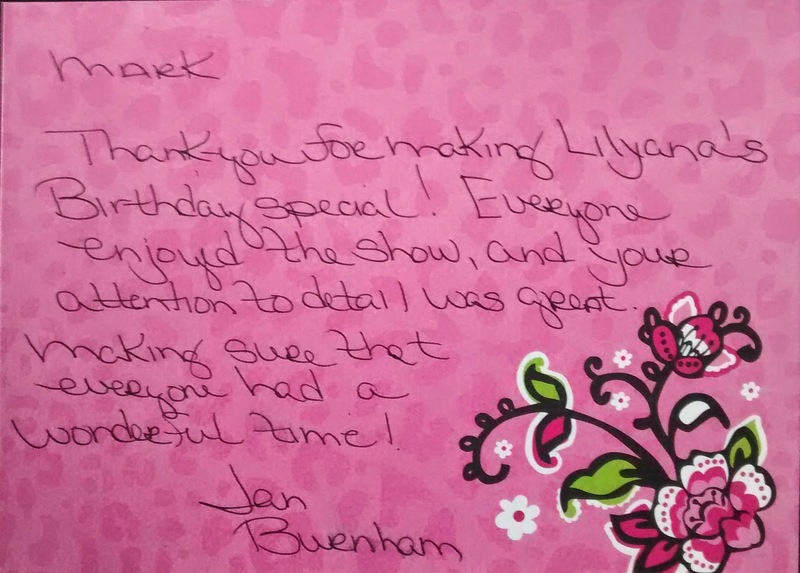 "Mark did an outstanding job entertaining for my mom's 93rd birthday in a memory care home. The crowd was mezmerized by his tricks. He stayed and mingled with the residents and made it that much more personal. I would recommend him for your event!" "Mark did a great job at my grandson Birthday party. Great with the kids and kept the adults laughing and entertained.Put on a great show and stuck around after the show to interact with my guests. Mark is great at he's job and it shows in the quality of he's work." "Awesome show Mark! !!! Thanks a bunch!" "A fantastic , fun magician. The kids, and adults had a blast .His tricks were amazing and Mark took the time and patience to make sure each child got the balloons they wanted. Thank you for a great addition to our party!" "I was little skeptical about everything at the beginning when I hired him, but I must say he has done a great job. I will recommend him to all my friends and anyone out there. He was so friendly with everyone, very pleasing, kids were just hooked up on his show. My husband is very hard to please but he was going GAGA about Mark and that really surprised me. I made a right choice by choosing Mark. Mark, Thank you for doing such a wonderful job. Hope you have success like this in future as well." "I hired for my 3 year old birthday party and he really grasped the kids attention. The kids had a blast. The balloon animals we also cool and quickly made. I really enjoyed working with Mark he was very professional and good at what he does. Will definitely keep in mind for future events." "Very good job, kept kids entertained. Perfect timing!" "Saw you at the Fraser party. Awesome! ! My daughter wants you at her party next month now." "Great show Mark Luedtke will definetly pass your info on to EVERYONE !!!!" "It was definitely great seeing you Mark Luedtke! It's been too long. Thomas Jordan most certainly enjoyed visiting with you and I know we'll see you at the VFW Christmas Party. You put on an excellent show that was enjoyed by all!" "Thanks for the show !!! I loved it !! So did everyone else:)"
"We LOVED having you! Your show was awesome!" "Mark was simply awesome! He was key to making my Son's 5th birthday a success. Every parent and child laughed and had a great time watching the show! We definitely recommend Mark for your party!" "You were awesome!! Thanks for sharing your magic!!" "It was a great birthday celebration today. Thank you to Mark Luedtke for a wonderful magician performance. The kids just loved it!!" "I would recommend him for kids party! The kids absolutely loved him! Mark Luedtke the magician." "He was awesome! The kids were soooo excited and I love that when they called him on a few of his "tricks" he pulled through with shining colors! smile emoticon Well worth it!" 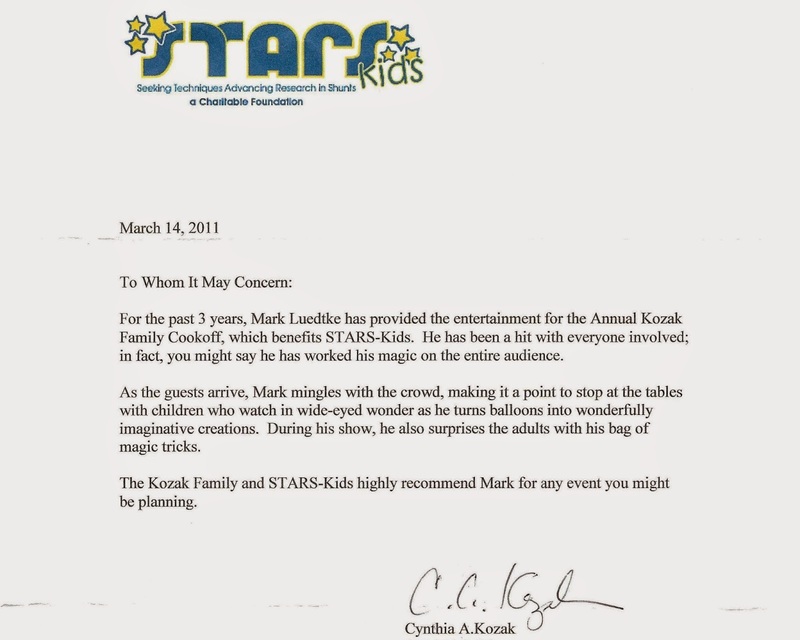 "Mark was the perfect entertainment for our daughter's 7th birthday party. All the guests (mix of family & friends and of all ages) really enjoyed Mark for the full hour - lots of ooos & aaaahhhhs and laughter. Would highly recommend Mark for any gathering"
"Mark was great! Both the kids and the adults enjoyed the show and he was really nice as a person also. I was worried since I hadn't seen his act and didn't want to set my expectations to high just in case but he surpassed my expectations! He put on a great show and made my son's party the talk of the town! I would definitely recommend him and use him again!" "He was an awesome magician and this was my favorite part of the show! So much fun!" "Thanks for a great show tonight!! We all had an awesome time watching you perform your illusions!!!!" "Mark - you were awesome. We all enjoyed you so much , you were right : " you did not disappoint". Evan is calling himself " Magician". You were so engaging. Thank you for bringing so much " Sunshine" to Evan's Birthday!" "Mark came early, stayed late, even when he was drenched in sweat and the line for balloon animals was so long, he smiled. I'm not sure how he managed! Kids loved him and want him back"
"I hired Mark to entertain at my son's 7th Birthday party and entertain he did! He is awesome! He was entertaining and friendly and made sure all the kids got balloon animals! He even was kind enough to replace a few kids balloons that popped. The kids were amazed and loved him! Highly recommended!" "You did an AWESOME job with the kids, Mark. They had so much fun. The laughter of the kids and their smiles was PRICELESS!!! Keep up the good work!" "That was an awesome birthday party. We've seen a few magic shows at the school event and park..he's the best so far. The kids were definitely not bored and he was very enthusiastic. A great performance!" "You really did an awesome job, Mark Luedtke, our Kids Director was at the other side of the church and she heard the kids laughing all the way down there!" "Mark is really fun guy and its awesome to have him at our party. He entertains my party member specially kids with his magic. I love to have him next time when ever I party next time"
"If ever you're looking for a magician who knows how to have fun and has a few tricks up his sleeve, Mark Luedtke is your guy! He was awesome!!!! Thanks for everything Mark!" "Mark did a great job for our event. You can tell he is very concerned that everyone is entertained. Reasonable priced and a very family friendly show. Good communication all the way to the day of the event. Really enjoyed the close up magic." "Thank you for a fantastic performance! Everyone loved your show and I received so many favorable compliments I wanted to pass them along, Hopefully your other booking went as well. I'll be sure to pass out your cards, though I only have a couple left. The other parents all loved the show too. Thank you again and I look forward to finding another opportunity to call on you"
"Mark did a great job entertaining the children during our cub scout blue and gold banquet. I would recommend him to anyone looking for entertainment for a party or event." "We hired him for our Blue and Gold Cub Scout Ceremony. He was very entertaining, the boys enjoyed the show very much!" "Thx for a great time and making Addison's party one for the books!!!" "Thank you again:). 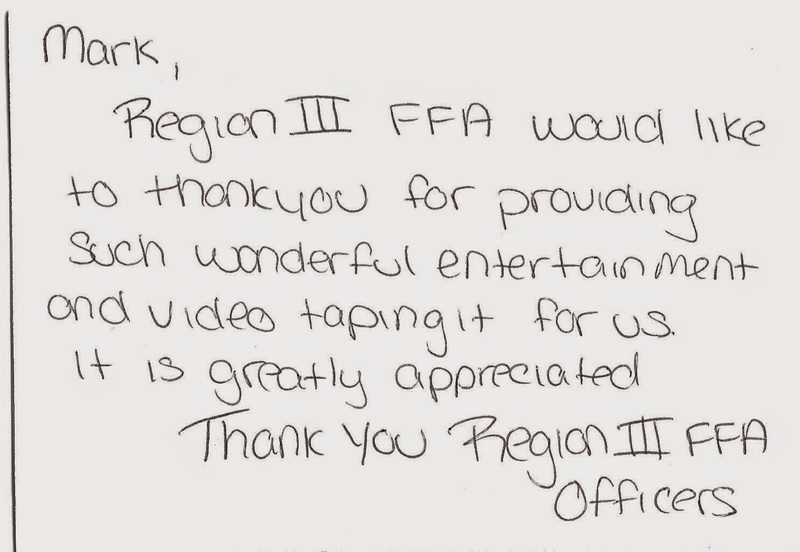 You provided awesome entertainment!" "Thank You So Much! What a Great Show!" "We were all so impressed with your awesome show and you managed to keep everybody engaged and entertained. Thank you for making Yara's Birthday unforgettable!"